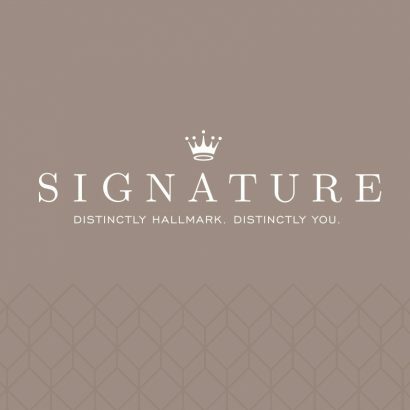 Hallmark Signature is the fastest growing premium greeting card brand. Signature cards are the best of the best – featuring premium paper and detailed embellishments that make these cards stand out. The Hallmark Signature Collection is a new offering of handcrafted everyday greeting cards. Each card is designed with beautiful papers, rich textures and just the right embellishments. Fresh, sophisticated designs are paired with concise and relevant messages in this collection. New embellishments include removable headbands, usable chalkboards, hair pins, necklaces, satin and sheer ribbon, faux pearls, beads and feathers. Color, texture and embellishment give shoppers a sense of discovery. “We wanted to meet all expectations in a stunning, uniquely Hallmark, ‘wow!’ kind of way,” Foster added. These cards are simply stated with style and substance, so the overall tone of the line is warm, genuine and fresh. Many of the cards feature imagery from current trends such as nesting dolls, fashion patterns, cupcakes, mustaches and even sushi! Each card is individually wrapped to protect the special features, and inside the package is an envelope specifically selected to match. Some envelopes are enhanced by heavy stock, shimmer or a designed liner. Prices begin at $3.95.